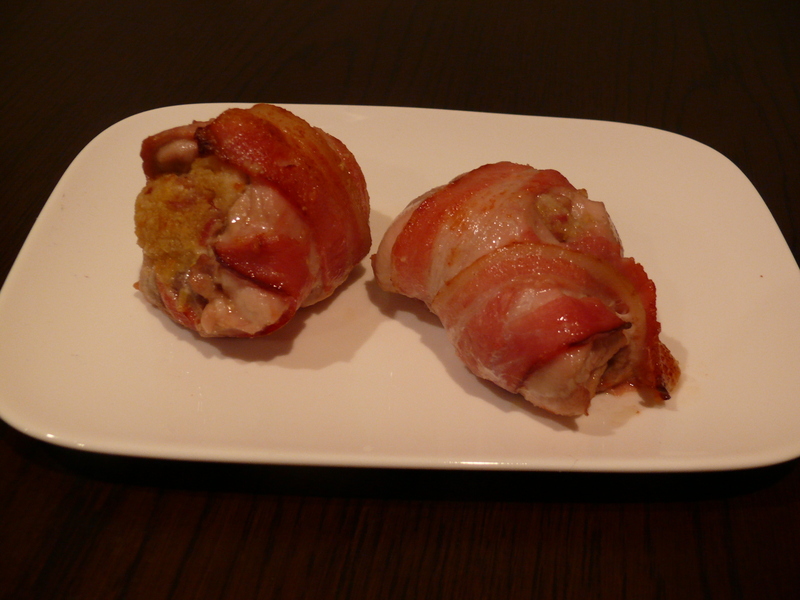 If you don’t like bacon stop reading right now because this chicken recipe has it inside and out! It also has a lovely lemony stuffing and the good news is that like all my recipes, the stuffing is grain-free and gluten-free. I haven’t made this dish since I changed to a Primal/Paleo lifestyle because, you know, it had a cup full of soft white breadcrumbs. Well, 18 months of cooking without wheat or grainy flour, I’m pretty game for any kind of experimentation. 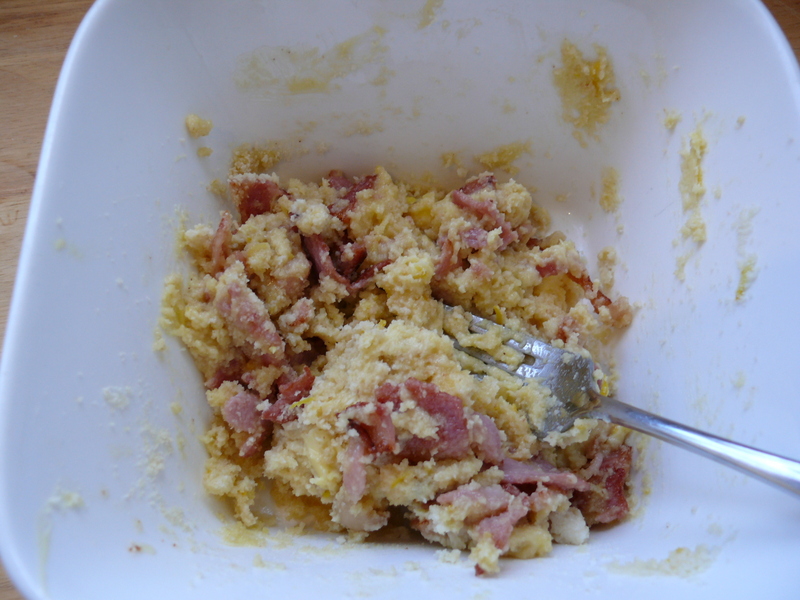 So almond meal came to mind – has the consistency of softish breadcrumbs, doesn’t taste to strong – works with cakes! So why not give it a whirl. Well the results turned out just yummy and I hope you enjoy it as much as we did! 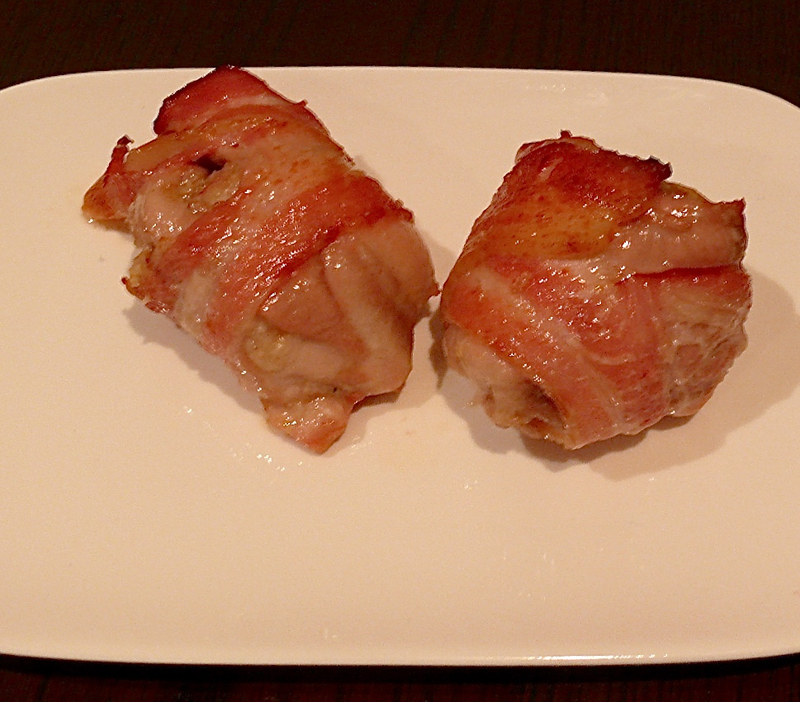 Wrapping – ah yes more bacon! Serve with some smashed cauliflower, steamed kale and a lovely Hollandaise sauce, if you want fancy. Just as nice served cold with a crispy salad and some Aoli. 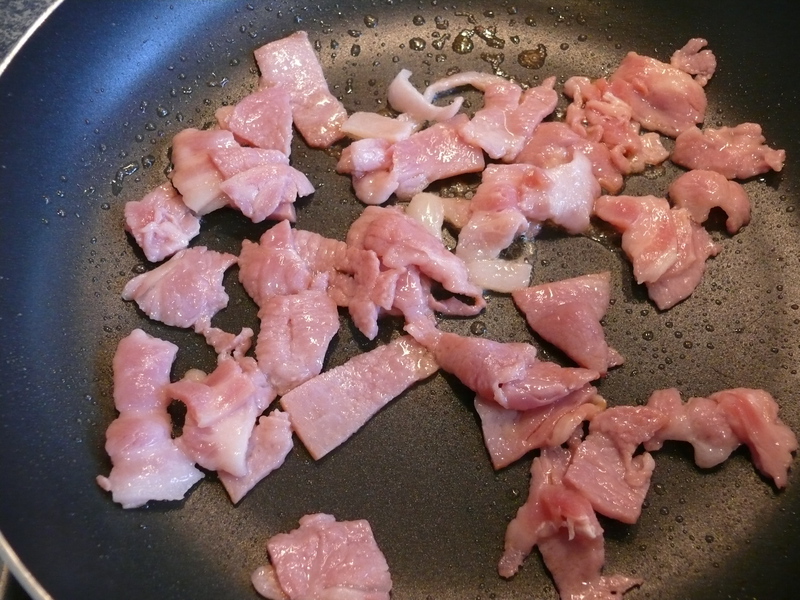 Chop bacon and gently fry until brown. Cool. 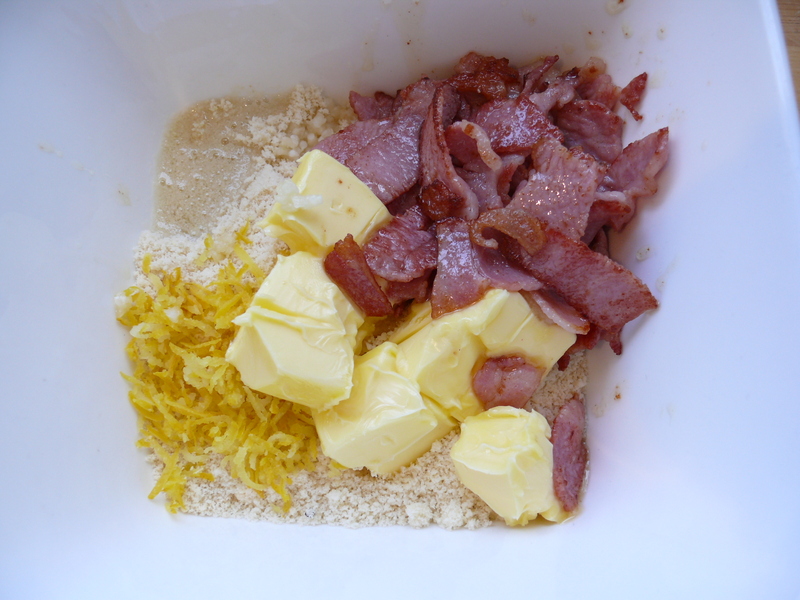 Mix cooled bacon with the almond meal, lemon zest and juice, butter, crushed garlic. 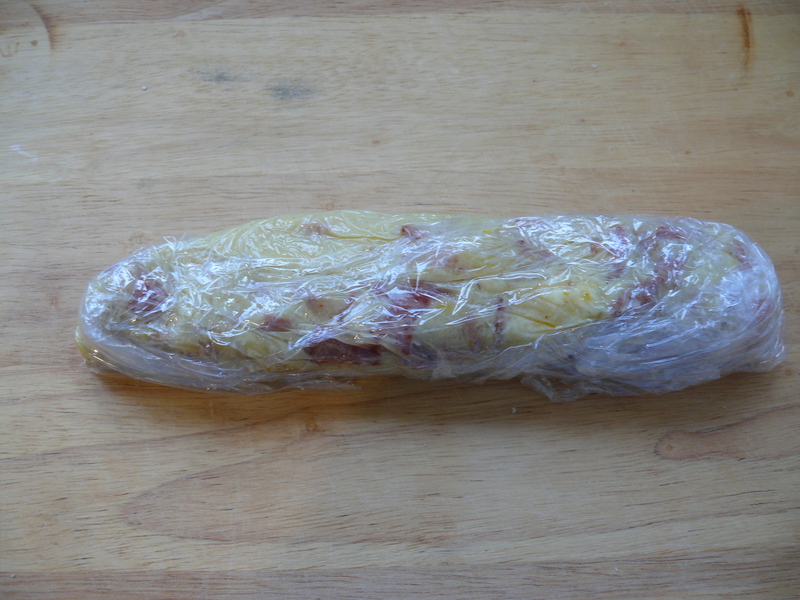 Shape into a long roll and wrap in cling wrap. 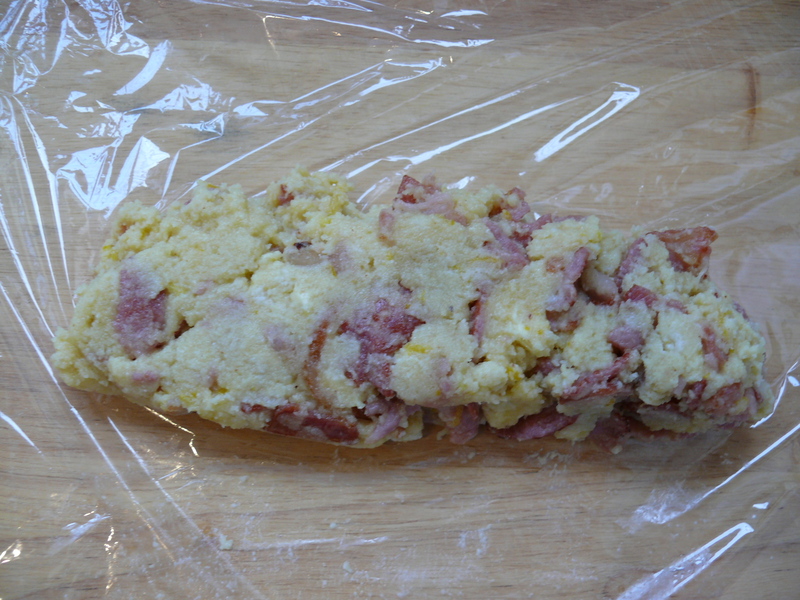 Remove stuffing from fridge and cut into 6 slices. 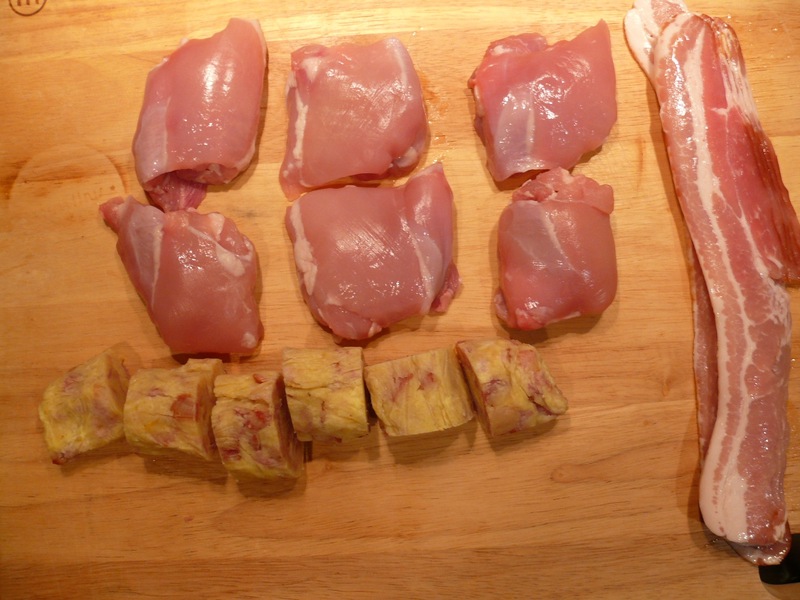 Open up each chicken thigh and place a piece of the stuffing in the middle. Fold the chicken around the stuffing. 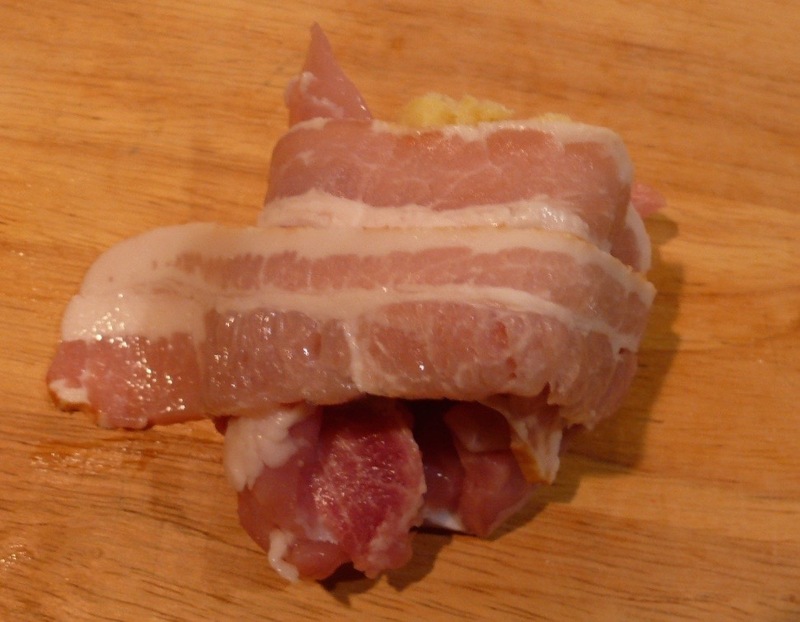 Wrap a piece of bacon around the chicken, like tying it with string. Place in a parchment lined baking tray. 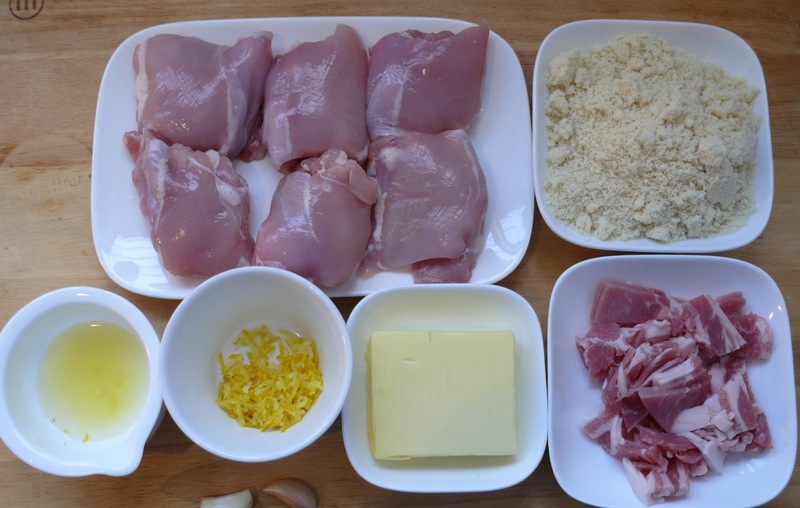 Bake in the oven for 10 to 15 minutes depending on the size of the chicken pieces. 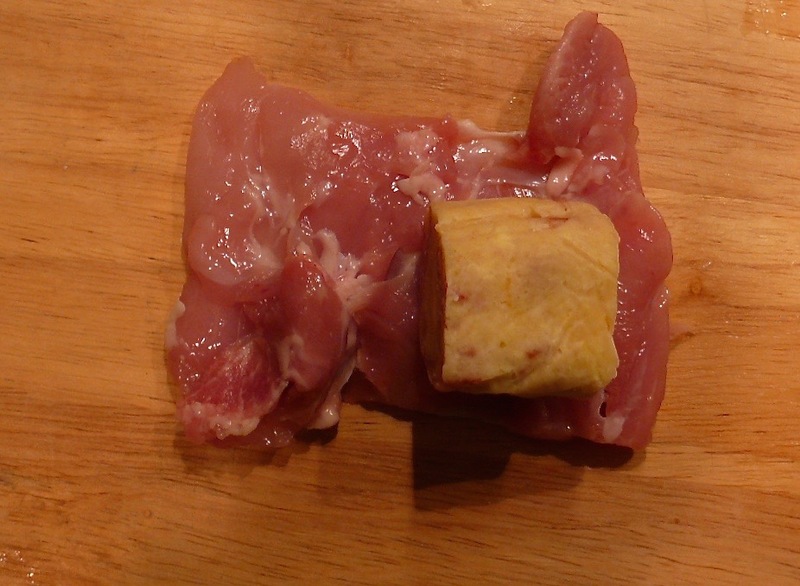 To test, slice though one and the meat juices will be clear. Note that this is a very generous amount of stuffing. You could easily extending this to a couple more chicken thighs and use a little less of the stuffing. 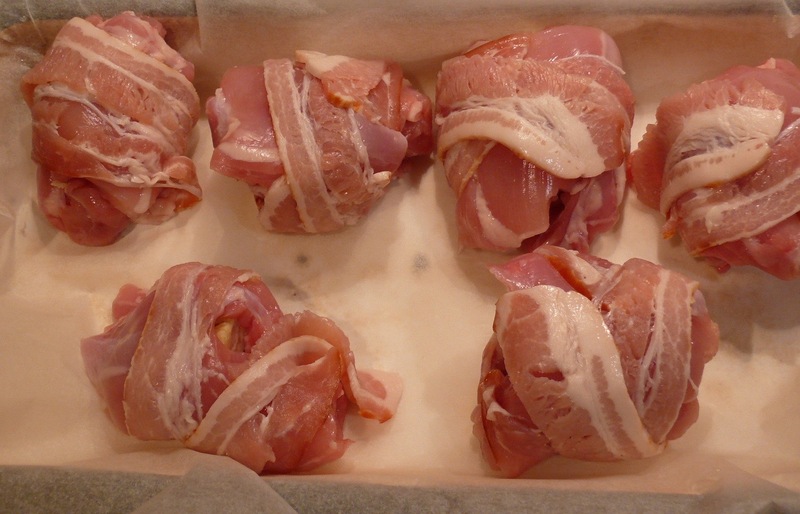 You only need to add a few more rashers of bacon for the wrapping.